Like many little girls, I grew up idolising Disney princesses. Ariel was my favourite; I never took her voicelessness too literally. When I was six years old I suggested my parents name my newborn brother ‘Prince Charming’. In my young eyes there could be nothing better. They went with ‘Liam’ instead. Once I was a little older, I saw my first Hayao Miyazaki film: Princess Mononoke. My then step-mother had given it to me, a gift from her parents in Japan. I remember being confused by it. The film was subtitled for one, not dubbed, and I found reading along difficult. The story was also unfamiliar to me. It didn’t follow the paternalistic patterns I was used to. Sure, there was a boy and a girl, but the story was about more than that. And if the story wasn’t about love, what was it about? As a girl I devoured love stories, but Miyazaki was right. Once exposed to the world outside of princes and princesses and cliché, heteronormative romance, love was no longer the thing closest to my heart. Instead I craved adventure, growth, independence, mystery, and the power to really do something. I wasn’t a princess, and deep down I never wanted to be. Chihiro speaks to that little girl. She’s glum, she’s angry, she’s adventurous and she’s questioning. As a child I found her both relatable and incredibly foreign; as an adult I find her revolutionary. Chihiro is, in Japanese culture, a sh?jo character. Sh?jo (??) is a Japanese word for girl. The word is broadly used to speak about women and girls under the age of 20. There are sh?jo manga (comics) aimed at girls, sh?jo television shows, and numerous other consumer items. The modern sh?jo originated in Japan during the late 19th to early 20th century, when a new middle class emerged and sent their daughters to private boarding schools rather than straight into the workforce. Instead of working, girls spent their adolescence surrounded by other young women. This idea of girlhood has created a sh?jo character who is idle, feminine and independent. She has little to do but shop, consume, and pine after boys. The sh?jo character is a consumer. Chihiro is not that character. Spirited Away explores the adoption of capitalism and consumerism into Japan’s national identity. In the film, Chihiro and her parents are moving to a new town, much to Chihiro’s dismay. On the way to their new house, they get lost and stumble upon what appears to be an old theme park. Curious, Chihiro’s dad decides to explore the park. Chihiro is reluctant, but her parents forge onwards to find empty stalls full of freshly cooked food. Her parents greedily gobble up the food and are soon transformed into pigs. Horrified, Chihiro runs into a boy named Haku and learns that she has entered a spirit world. She must take a job at the bathhouse, under the strict rule of Yubaba, until she can find a way to break the spell on her parents and return home. Most characters are greedy, especially Yubaba, the bathhouse owner, and her workers. Yet throughout the film Chihiro is indifferent to material desire. Despite No-Face’s attempts to entice Chihiro with bath tokens and gold (“Take the gold! Take it! Take it!”), she never gives into temptation. Chihiro’s childish innocence remains uncorrupted, making her a perfect contrast to the greedy institution of the bathhouse. Film critic Ayumi Suzuki (2009), describes this greed as a comparison between the spirit world and a capitalist Japan. After consuming the goods of the spirit world Chihiro’s parents become pigs. The spirit world is centred around greed, and greed is always punished. Unlike Chihiro, No-Face is quickly corrupted by greed and becomes a symbol of consumerism by spurting gold and consuming, quite literally, everyone and everything around him. Gold is used as the currency of choice in the spirit world and becomes a powerful, negative symbol. Those who succumb to their love of gold are met with misfortune. Yubaba is so fixated on her gold that she neglects to notice her own child has gone missing. Upon realisation of her folly, her gold immediately turns to mud. The fact that Chihiro never succumbs to the temptations of greed is, in my eyes, radical. It speaks to a form of feminine empowerment that goes beyond western notions of “Girl Power.” Advertising campaigns sell us our empowerment by telling us that the one thing we need to do to feel strong is to buy their product. Chihiro would never fall for that. Yubaba, the bathhouse owner, represents the kind of western consumerism I grew up with. She wears western clothes and resides in a western-style apartment. She values her staff only so long as they are able to work. One worker tells Chihiro “If you don’t get a job, Yubaba will turn you into an animal”. Yubaba is the boss, everyone else is secondary. This power model is all too familiar: I’m sure I’m not alone in having felt like an animal to a corporate machine. But Chihiro teaches me to look beyond greed. While material goods may bring power in our current world, they do not bring empowerment. It’s rewarding to see that Chihiro’s example has been followed in other children’s films since Spirited Away’s release in 2001. Merida in Brave fought for her own independence. Elsa and Anna in Frozen fought for sisterly love, although I always thought Lilo and Stitch did it better. The next generation of women will grow up with female characters who don’t rely on fathers or princes to make them whole. 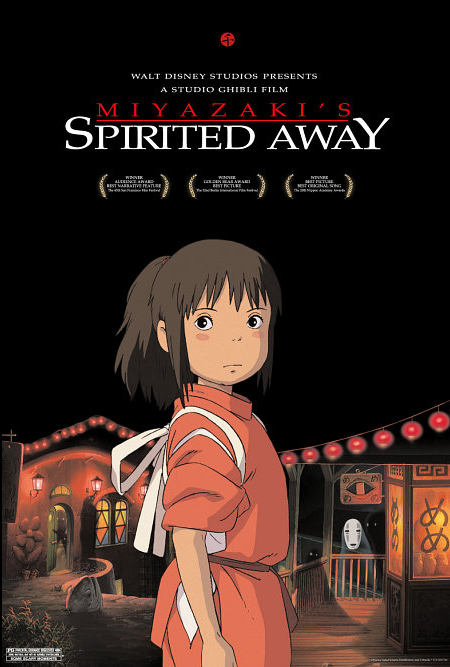 But I’m yet to see another children’s film that stares down our consumer society quite as fiercely as Spirited Away. In a culture of greed, it’s easy to fear that all is lost; that being a woman is to be a commodity. Yet Spirited Away gives me hope. I do not have to succumb to greed. And when society is getting me down, as Chihiro says, “I think I can handle it”. Emma Hardy is a copywriter and freelance writer who writes about feminism, lived experiences, and contemporary culture. This entry was posted in Film and tagged feminism, film, women, world. Bookmark the permalink.